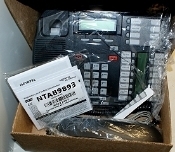 Nortel T7316E Telephone - NEW - Charcoal Complete, includes everything pictured. NTAB9893 Release 2 A0511457. Full-featured, multi-line telephone that has a two-line, 16-character-per-line display that is menu driven and supported by three context-sensitive soft keys. Provides access to 24 memory buttons, 16 of which include multi-segment icons for fast and precise decision making. Designed for high call volums.